Happy Monday! Wow, I feel like I haven’t posted on the blog in forever. Life has been a little crazy lately (and that’s being nice). First, the apartment didn’t have cable or wifi. Still no cable, but thankfully we got wifi on Wednesday. It’s just been insane! Not an easy transition from Miami to NYC but I know it’ll start getting better now. I do miss my puppies so much, though. Anyways, I’ve posted this dress a few times on Instagram before and I am in love with it! It’s just a perfect summer dress to throw on and walk out in. You can also dress it up or down, which is always a plus in my book. I love the tiers, too. 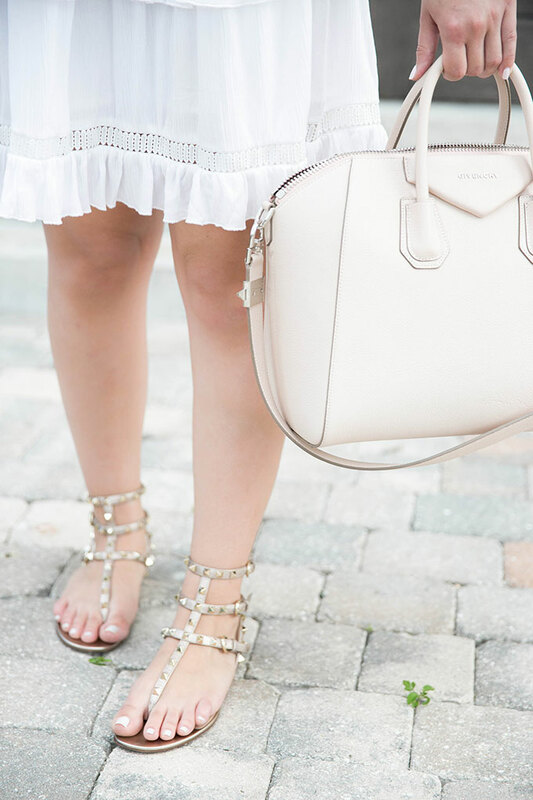 I mean, what’s better than a white tiered dress? The price is also just as great at just under $60! I actually wore it backwards, so keep that in mind if you buy it and style it… haha. I kind of like it this way, though! I didn’t even notice it was backwards until I saw the way that the model styled it online. So pretty Lauren! Funny that you have it on backwards, I think I might like it better this way, though! wow you look stunning! That bag is for sure on my want list now! Pretty! Love the dress — the whole look looks great on you! What a pretty dress! It’s perfect for the summer. That dress is GORGEOUS! And it looks amazing on you! Such a pretty dress! And I love your lipstick! What color is that? How adorable! You pull this dress off so well! I love how simple yet sophisticated it looks. Such a pretty summer look! And I love those sandals. Perfect. I absolutely adore this dress. It’s beautiful. Miami to NYC is definitely a huge transition. Good luck!! So gorgeous!!! I die for that dress and I love that you styled it backwards. I just love absolutely everything you wear! You look amazing, and this outfit is styled perfectly! I love the shoes! So cute..ordering this! Are you wearing anything under it? It looks pretty sheer on the website, but not so much on you.